Open the battery compartment by pressing firmly on the finger indent and sliding the cover down. The cover is tethered to the module. Do not attempt to detach it. If batteries are installed, remove them. In the battery compartment, you can see and change the switch positions. To change the position of a switch, use a pen or a small flat tipped screwdriver to gently move the switch. Set at the factory to enable the auto-on function. 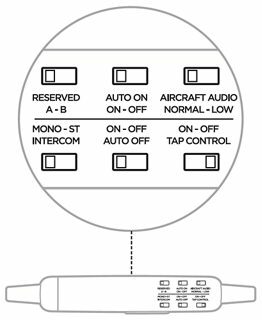 The headset will turn on when aircraft power is available. To disable auto-on, set the switch to the off position. With the switch in the off position, the user must manually turn the headset on. Set the sensitivity of intercom audio to Normal or Low (-12 dB). Set at the factory to enable the auto-off function. The headset will turn off after three to nine minutes of inactivity. To disable auto-off, set the switch to the off position. With the switch in the off position, the user must manually turn the headset off. By default, Tap Control is disabled. With Tap control turned on, you can double tap an earbud to toggle that earbud's noise cancellation mode between Low and the control module’s Acoustic Noise Cancellation switch setting.